Ever wondered how to fight someone taller than you? Course you have that’s why you’re here…the following are my tips for boxing or fighting a taller opponent and/or a bigger opponent. If you are short, or short for your weight class like me, then you pretty much have to get used to taking a jab. Take it on your forehead if you have to, but try not to back up. Ideally you’ll slip and counter, or block and counter, or even, as mentioned, take it on your forehead by keeping your chin right down. Correction – it is possible to use the layback to stutter step, and counter an opponent’s jab by bending the rear leg, leaning back, then driving forwards from the rear leg into range. You have to be really tough for this to work, which unfortunately I am definitely not. Taller guys can keep safe, at the end of a jab, and win fights without taking any damage at all. It’s not as easy for a shorter fighter, generally speaking you have to be more aggressive and get stuck in. If you continually back up after a jab, you’ll never get in your own range and you won’t be able to counter. If possible you want to move forward, and just ‘walk through’ your opponents jab. 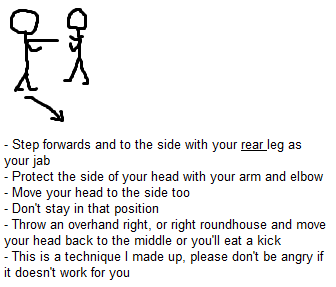 you could practice parrying a jab and stepping forward (and to the side a bit) with a right foot. Move your head to the right and off centre line, then throw your own jab. I like to do a normal jab, then follow up immediately with this “step-through” version. If countering with a jab doesn’t work, do the same thing but throw an inside leg kick, or front kick instead of a jab. You can also try Wing Chun ‘elbow destroys’. Instead of parrying your partner’s jab, bring your right elbow up, so the point of your elbow clashes with his fist. Same goes for his kicks. Step into any of your opponent’s round kicks and counter with a punch. Sweep away or grab hold of a front kick/teep with your hand (keep your other hand up) & counter. You can also block a front kick to the body by lifting your knee up (similar to how you’d block a low thai roundhouse). Drill slipping a jab and countering kicks. Drill it lots. I still ‘forget’ to do it if I don’t practice. It’s instinct to back away when someone’s throwing limbs at you. Boxer 2 jabs Boxer 1 in the forehead (very lightly) and hooks & crosses him to the body. Boxer 1 has to try and keep his eyes open throughout and try not to flinch away. Don’t make the mistake of throwing from too far out. See the first Ken Shamrock V Tito fight at UFC 40 for a good example. Ken was throwing combos in the second round and was missing the mark by about half a foot. Ken was then picked off by straight punches from the longer Tito. Again, practice parrying a jab with your right hand (tap the wrist of a left jab towards your left shoulder if you stand in left-lead stance), and slipping your head to the right of the jab. It’s hard to get your distance. I remember I always used to throw from miles too far out, and lean back at the same time to avoid getting punched myself. I used to think if I could just about reach with a headbutt or elbow, then I’ll punch, otherwise I’ll just feint punches or throw a ‘feeler’ jab. This worked for me. Obviously don’t throw a headbutt or elbow unless you’re fighting a tiger or something. When you’re better at controlling distancing, and moving in and out, and getting your timing right; then you can play around with holding your ground and countering, and using footwork to move away, pivot etc. Instead of just holding your ground and countering every single time. Standing your ground and trading is more of a traditional Muay Thai style. It does work, but you may prefer to pick and choose when to stay in the pocket, and when to move out of range. Boxing seems to be more about hitting, without being hit, and as a result has more footwork, pivoting and head-movement; Thai boxers stand and trade more; or at least, stand and counter-strike. Not sure it’s the best style for MMA, unless you don’t mind getting taken down. One final great way to get into your own range is to throw a feeler jab of your own, and then step under your opponent’s counter jab or follow with an overhand right. Lots of tall guys will be counter-strikers. Goad them out of their defensive shell with a a feeler jab of your own – 1 that’s just an inch or 2 out of range, and follow up with an overhand right or a sidestep to the right, so you can ‘counter his counter’. This is where he can reach you, but you can’t reach him/her. I would only throw a punch from far out, if it is a jab, and you are trying to create a reaction from the opponent and draw them into your range. Rousey likes to jab her way into the clinch. She throws a jab, or a double jab, and often her opponents react by throwing back, at which point she can slip and get the clinch. single strike attacks, combination attacks, attack by drawing (e.g. throwing a jab, to get your opponent to stand his/her ground and throw back), indirect attack & hand immobilisation attack. These 5 options should give you a large enough arsenal and array of techniques and set ups to prevent you becoming frustrated and immobilised by a long jab. If the guy is stronger and taller, avoid the clinch at all costs. Unless you’ve got a specifically strong Greco/Judo/Thai clinch game. A great way to get into your own range, is to make him come to you. Don’t constantly chase him down, instead you can stay well out of his kicking range, and make him move towards you. Keep moving and throwing feints, when he jabs, step into the jab, and counter. Nick Diaz did a good job of making Anderson come to him. Taller guys usually expect you to chase them. Notice that he tends to throw a jab, or simply walk forwards and then slip, slip then bob and weave when he’s in his opponent range. Often he’ll bob and weave really low so that a jab can’t have any effect. Either way, he closes the distance up against the ropes, and importantly, he gets his opponent to engage and throw strikes before countering with his own hooks and uppercuts. This is more risky in MMA, as you can end up eating a knee. But experiment with it; it’s certainly worth watching Tyson in his prime. Ideally you’ll bob and weave until you back your opponent up against the cage or ropes, then you can start your ‘in-fighting’ with hooks and uppercuts. Change your level by squatting, as well as moving your head side to side. In boxing you can get away with dropping your level and head so you are ‘below’ the punches. In thai or MMA you can get kneed in the head though. I’d still drill and practice this for MMA; perhaps use it sparingly though. Moving forward constantly also makes it really hard for a taller guy to throw round-house style kicks. But makes front kicks more effective, and jumping knees – so be wary. The double jab is awesome, for setting up everything from takedowns to overhand rights and Thai roundhouse kicks. Use this to keep or get yourself in range. Keep your chin down and your rear hand in front of your chin. I also use the double jab a lot, but move to the side, helping set up an angle for a kick. If you are both using your jab, the taller opponent will keep you at bay and outreach you every time. However, if you move your head out of centre-line when you are jabbing, your opponent may find it difficult to catch you. Jabbing with your head moved to the side, and slightly forwards, will increase your reach and help you to avoid your opponent’s jab. Be careful not to move into a left hook or roundhouse though. Against Jon Jones Gus’ was constantly moving his head to his right as he jabbed, and eventually got caught with a kick and a spinning elbow. If you slip your head to the right as you jab with your left hand, then keep you right hand up against your right ear or even against your left ear, so your forearm protects your face and your right elbow protects the right hand side of your head. Don’t leave your head in that position, come back into the middle with your left hand protecting the left hand side of your face, or bob and weave. Jab with head to the side. Turn thumb down at the end of the punch. Set this up Dan Henderson style with an inside leg kick and then slam your foot down and throw your punch like you’re bowling a cricket ball. Look at the guys toes and swing your head down, making it a whole body and core movement like smashing with a sledge hammer, rather than just a movement of the arm. Be wary of an uppercut counter. Here’s a really good video of someone doing an overhand right. The video seemed to illustrate the movement better than the pictures. The power comes mainly from your core. Hitting a sledgehammer into a tyre or chopping wood are two good ways of building overhand right power. You can do a really looping overhand, like a bowling action with your arm straight momentarily, or you can do a ‘shorter’ version with your elbow bent throughout. See the Mark Hunt Analysis for Russian hooks. Your throw the punch with your arm rotated and the thumb turned down towards the floor. This gives it more range. You can even throw a kind of Russian-hook-overhand-right. Throw the overhand right, like you’re bowling a cricket ball, and turn the knuckles right over for extra reach and power. A classic example of this is the ‘Vitor Blitz’ against Wanderlai Silva in Brazil. He throws a straight left, then steps forward with his right foot and throws a straight right, then steps forward with his left foot and throws another left, etc. Don’t do a whole ‘blitz’ every time, but you can experiment with stepping forwards with your right foot (if you are in orthodox stance), moving into a southpaw stance and throwing the cross at the same time. This obviously gives you much more range, but can be telegraphed/too slow. Try it also with the double jab, jab as normal, and then on the second jab, step forwards with your right foot. In left-lead stance, I like to squat down as if I’m going to go for a takedown, then throw an uppercut as I step forward with my right leg (keeping my head to the right hand side), then throw a left cross. At UFC 185, against Overeem, Roy Nelson appeared to get a knock-down by throwing an uppercut as he moved his right foot forward into south-paw stance, and then landed a looping hook stepping forward into orthodox. Just be careful you don’t walk into a strike, like Forrest Griffin did against Anderson Silva. Keep you chin tucked, elbows and shoulders high. This is completely unorthodox, and something I kind of made up. This way, even if his arms are twice as long as yours; as you are stepping forward and jabbing, you should still be able to land. I’d say this is the 2nd most important thing to practice, behind countering the jab. Whether it be a takedown, a ‘scoop’ with your hand, a spinning kick or a side step, you’ll need a good counter if you’re fighting taller guys. You can usually block it just by raising your knee as you would to block a roundhouse. You can also dodge most front kicks to the body by sucking your belly in and throwing your feet and hips back. Just make sure at least 1 hand is still protecting your face. A block is good, but obviously an effective counter is much better. Drill blocking by lifting your leg up, then countering with your own kick. Try shifting your hips back, grabbing the kick and sweeping his standing leg. Stay in the pocket, keep your chin tucked, move your head out of centre-line and counter punches with kicks. If you are both in orthodox stance, your left leg will be pretty close to his left leg, but you’ll probably get less power on an inside leg kick then a normal roundhouse. If a kick to the Thai doesn’t do much damage, you can try kicking the calf, or even stamping/side kicking his knee (although I wouldn’t risk injuring someone’s knee with this in training). Countering punches with kicks is one of my favourite ever techniques. Perhaps because I don’t like getting punched, or punching people in the face too much (in training, never know how hard to go). 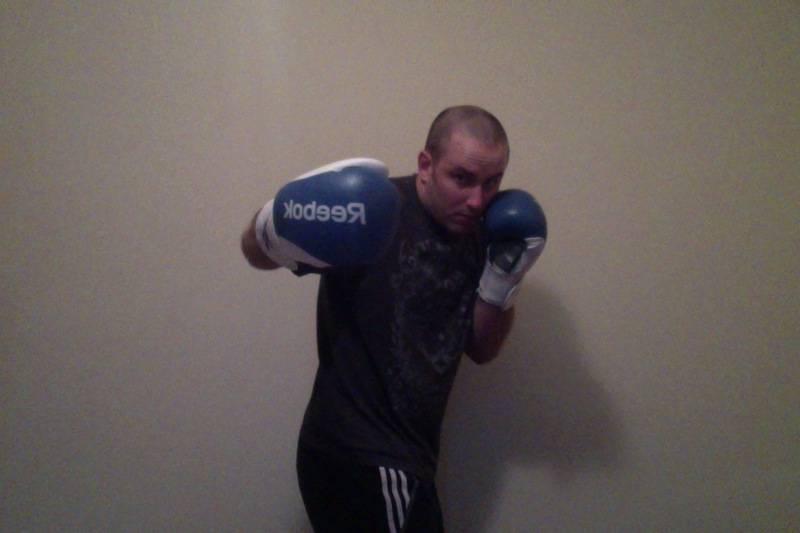 I’ll throw jabs to ‘engage’ the striking, then cover up and throw low kicks. Mix it up with inside kicks, front kicks and maybe a knee or you’ll get the kicks checked. Change up your rhythm, twitch your shoulders, move your head off ‘centre-line’, lift your knee up, dummy a jab – then throw a jab straight afterwards. Keep the other guy guessing constantly. Constantly drop your level and make your opponent think about the takedown. Just bend your legs and drop your shoulders. A good technique is dropping your level and then touching the opponent’s leading knee and switching to an uppercut with the same hand. 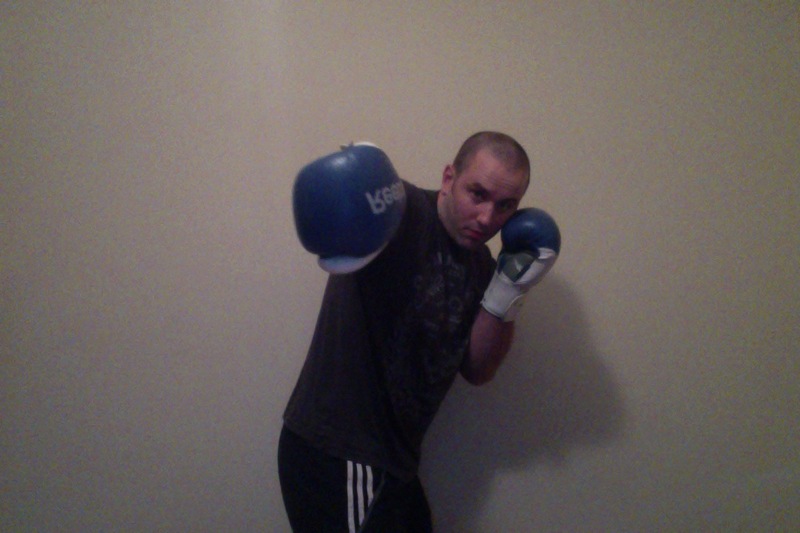 I’ve been caught out using these a few times, and ended up jumping onto a front kick or a jab. Keep one hand up, to protect your face. You can even protect it with your elbow. This is a great technique, follow up with a right roundhouse as shown by GSP above. You can even follow up with a left front kick or teep. Instead of putting your left leg down on the floor, after you throw your jab. Throw a left front kick instead. Interestingly, in the above GIF, which I’ve borrowed from mma-core.com , 1 guy is wearing leggings. Also, the fella throwing the punch leaves himself really open, I’d recommend being tighter with your guard than this; if possible, we all do things incorrect in fights. Interestingly, he also seems to throw a jab before his superman punch. This might be a combination/feint to try out. This helps immensely. I haven’t found it much use with BJJ, but for stand up, and MMA sparring, filming allows you to view yourself more objectively. It’s crazy what you do incorrectly and don’t realise it. If you’re short, you have the advantage of being at a low level, and being able to get under your opponent’s hips easier. 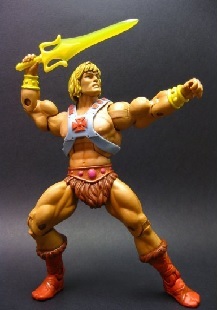 If someone has long and skinny legs, they are usually more susceptible to a takedown than a shorter, stockier fellow. I like to shoot for a single – i.e. grab hold of their lead leg, go for a ‘run-the-pipe’ takedown and change it into a double. Try not to shoot from too far out. Practice setting up the takedowns, with a double jab, and by slipping your opponent’s jab and dropping under it. I even like to shoot for a double leg after a superman punch. It seems to work, unorthodox techniques seem to be the easiest to pull off as nobody predicts what you’re attempting. On the ground, one of the main differences is going to be how easily your closed guard will be broken. Don’t reinvent the wheel, stand on the shoulders of giants…or smaller people. Watch Randy Couture V Tim Sylvia – loads of head movement, greco takedowns and of course that overhand-right at the very start. Watch Mark Hunt’s fights, Melvin Manhoef, Mike Tyson, Rashad Evans, Sean Sherk, Fedor. Look at what type of strikes and takedowns they use. Their head movement, footwork and combinations. Have a look for “boxing in-fighting” on youtube. You may have to literally WALK forwards. Pushing off from your rear-foot and sliding forwards, sometimes won’t work. Again, watch Tyson. Watch how he moves forwards, through and/or underneath people’s jabs, and backs them against the ropes. Liver punch, left hook to the head, and then a right uppecut is a classic combination. 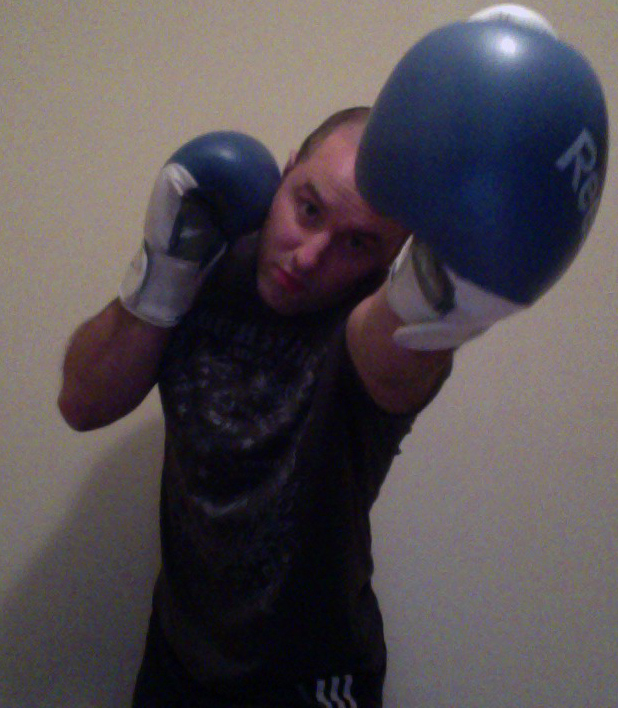 Drop your level, don’t raise up too far (if at all) when throwing the left hook to the head. You should also work on Thai-clinch, with emphasis on defence. Practice pummeling for neck/head control, and different defenses. For example, pushing on the opponents chin, pushing up on one of his elbows and pulling downwards on the bicep of his opposite hand, turning your hips side on etc. One ’emergency’ way to block a knee, is by throwing your own knee upwards at the same time. Strengthen your neck and lower back too, so your posture can’t be broken down. Of course, you can also punch your way out of a clinch too. Don’t stand at range and ‘think’ about what you’re going to do. Your default mode should be pressing forward. Literally walk forward, step forward with your left and then your right foot, keep your chin tucked behind your front shoulder. Use the front kick counters you’ve worked on and slip inside and outside of the jab and counter with kicks and/or takedowns. you may have to ‘dummy’ moving forwards, sidestep more and circle more to prevent yourself walk straight into it. This seems to be a great method for drawing a punch from a taller opponent. The key is to drop your level, and bend forwards so that your head is closer to your opponent than if you were stood up straight. The crouched position is also a great position to counter from – with your legs bent you can explode into a punch or kick. So you’re into the final round of your fight against a tall guy (or any guy really) and your just can’t bridge the gap in range. You might need to try some higher risk techniques. Try countering his jab with a spinning back fist. Shoot for a low single or ankle pick. The point is – always have a plan B. You see a lot of fighters get frustrated and mentally give-in when their game plan just doesn’t work. – Don’t fight at his range – press forward or circle on the outside. Circle away from his power (usually this means circling to your right against a right-handed fighter). – You must find a way to ‘move through’ the jabs and front kicks, if you back away from them you’ll be stuck at long-range. Use the lean back against the jab, but immediately get back into range. Better to parry & slip than constantly back up. – Try and get him to engage with ‘feeler’ strikes like a quick jab and when he fires back, slip your head to the side and counter with a kick, punch or takedown. Ronda Rousey uses a double jab to get opponent’s to fire back and trade punches, she then slips into grappling range. – You must jab with your head to the side or with your chin really tucked. Otherwise you’ll walk into a longer jab. – The most successful technique against a tall guy (in terms of percentage landed) appears to be an inside leg kick as a jab counter. It lands the most but obviously doesn’t do as much damage as an overhand right. – Work on explosive power and also endurance. The best short guys all seem to be either mega explosive (e.g. Hector Lombard) and/or have a really high work rate (Cain – fairly short for a HW). – If you are short and stocky, chances are, wrestling will be your strength. Keep working on all aspects of your game though, don’t give up on the striking or the guard game. I’ll look to get to my knees and go for a takedown, rather than pull guard from positions like on-bottom in side-control. – Don’t look up at his/her face, or your chin will stick out, Look forwards. 3. Infighting – finding range. Spar with your partner; but only with jabs. 6. On the pads – inside leg kick, overhand right combo. 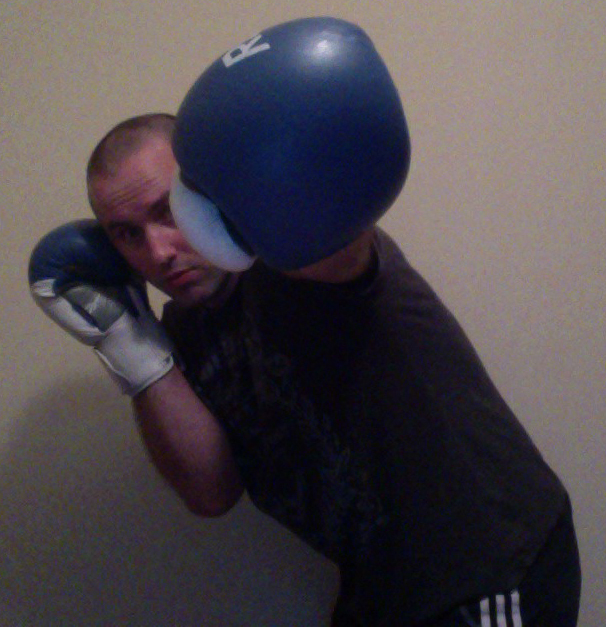 – Jab to the body, overhand right combo. Rather than shuffling forwards, I try to walk forwards. But maybe that’s why I’m rubbish. Just watched UFC fight night in Brazil and saw a good tall vs short fight (can’t remember the fighters name unfortunately). The shorter guy was using the inside leg kick brilliantly. Both fighters were in orthodox stance, so their left legs were pretty close to each other. He was smashing his shin into the calf and thigh. This is definitely the easiest and closest weapon you have. Be very careful of a counter right hand, straight down the middle. Interested in Sports Nutrition for MMA? or click here for the free (slightly shorter) version. Very intresting and informetive article, liked your writing style too. It is usually quite challenging for a short fighter to fight the taller opponent because the taller one always has some advantage of height. The tips mentioned in the article are very informative while fighting a taller opponent. you said to watch short guys fight, could you please provide some video links. that would be very helpful.